I’m connected to hundreds of HR professionals and Recruiters. Right now many of them are trying to find that perfect new candidate to join their team. If you are not on Twitter then you are missing out because recruiters are tweeting job openings under the hashtags #jobs #work #careers all the time. I try to separate myself from most resume writers in a variety of ways but one in particular is by actually following up with my clients to check their progress. Although I use a similar process for each client, the results are very different. All clients aren’t created equal – some have more education, more experience and more confidence than others. Some of my clients are achieving very high levels of success while others aren’t and upon further investigation I have put together the commonalities of those who have stalled a bit. 1. You social media shares. Selfies, Scandal, The Kardashians, guns, drugs and designer shoes won’t help you get a job. 2. Your bad reputation. Not your online reputation – I mean your IRL reputation.You are not a nice person or you were a bad boss or you are difficult and defensive – word gets out quickly, plus it’s my experience that when it comes to nasty people, their nastiness comes through during the interview process. 3. You have stopped looking altogether. Hunting for a new job can be a crap-shoot. Sometimes you find the job you want right away, get an interview and get hired – BAM! Done. But unfortunately that doesn’t happen too often. It requires more searching and patience than most people have. 4. You are not using all your resources. 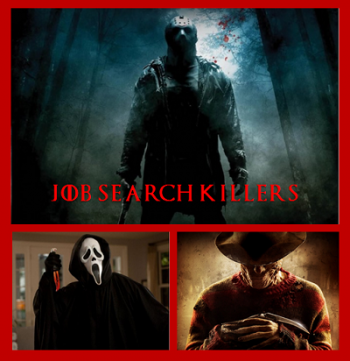 Monster, Careerbuilder, Indeed are the biggest and most popular places for job seekers but they aren’t the only ones. I don’t want to get too technical here but there are job boards, job aggregators, career pages and company pages and on and on. My favorite sources are SimplyHired, Social Media (Twitter and LinkedIn) and your personal network. You can also use technology to help you – download job apps and get notifications on new jobs. Also don’t forget the power of a career fair. 5. You are waiting for the phone to ring. Loading your resume on a job board and waiting for calls is probably not going to work. You need to be more aggressive than that. If you don’t have time to look then hire a headhunter or search specialist to help you – but it will cost you. 6. You are tired of being judged. Recruiters and hiring managers judge people. That’s what they do and sometimes it’s hard trying to please everyone, figure out what they want from you, and sell yourself as their ultimate problem solver. You can’t stop the judgment just be comfortable with your narrative and stick to the script. 7. You really don’t want it bad enough. This is about desire, confidence, grit, patience and vision. You want it if it’s easy but anything worth having is worth working for. You have to know your value and what makes you happy and continuously pursue it. Don’t get discouraged, frustrated and give up. Keep looking because the moment you stop – your dream job may be posted. 8. Your resume is so bad. I’ve learned the importance of a good resume – it changes lives. But I am also learning that many people have bad resumes – know it but still insist on sending those bad resumes out to employers…why? Get your resume, cover letter and LinkedIn in shape, it makes a whale of a difference out there. ← Today More People Are Quitting And You Should Too!